Now let's move on to the Penguin. This little guy is simply adorable!!!! 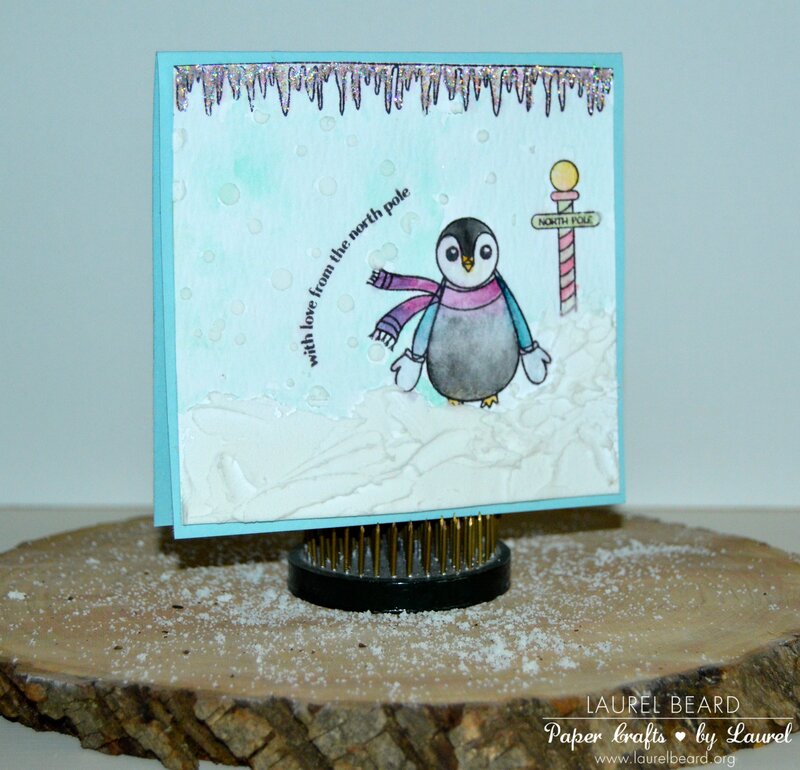 I've paired him up with the Big Bang Circle creative screening to create a wintery scene. 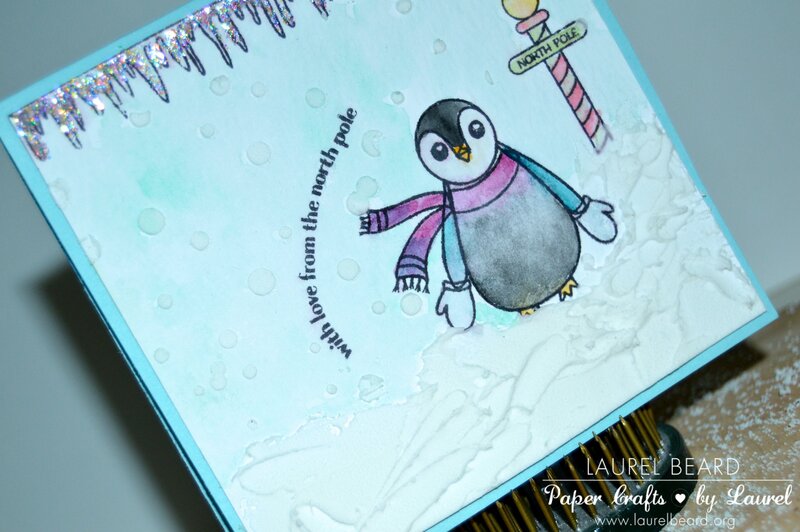 I stamped all of the images from The Penguin stamp set onto some watercolored card stock and added some color using my Gansai Watercolors.. I arched the sentiment (another thing I LOVE about clear stamps).. Yup, you can reshape your sentiments on your acrylic blocks.... I love the icicles in the set! So fun.. I filled those in with some ICE stickles. I love that all the accessories for the penguin that come on this set. I shall name him Frosty. And finally, let's check out The Gift. This set is full of adorable pet images! Two dogs, a cat, a bear! And lots of fun accessories and even things to stuff them into if you wish! 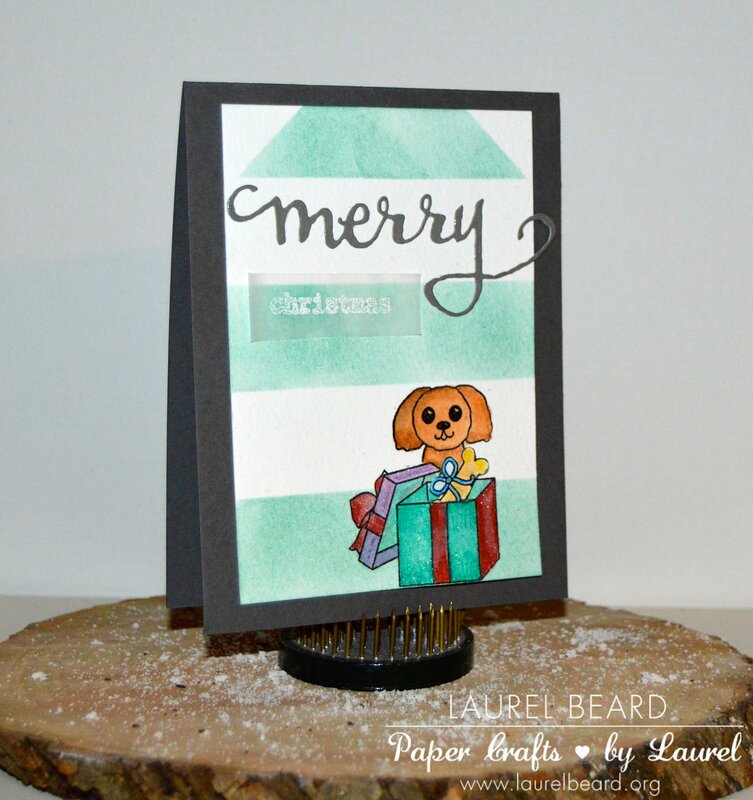 I've paired the adorbable dog image with two other products from their recent release... The Big, the Bold and the Merry Cutaways and the Grand Diagonal Creative Screening.... I once again stamped the images onto some watercolor card stock and heat embossed. I did some creative masking so it would appear as if the dog was sitting behind the present. I stamped the bone and fussy cut it out and stuffed it into the gift box and did some quick watercoloring! For the creative screening, I turned it on its side to get the diagonals going in the direction I wanted them to and then gently inked it up with some distress ink. So that's it for today! I'll be back next week for some more Winnie and Walter fun! Until then, I've got a giveaway!!! Simply head on over to my blog and leave comments on all of my Leading Lady posts, and you could win a $30 gift card to Winnie and Walter!!! I will choose a winner at the end of the month from all of the Leading Lady posts, so you've got lots of opportunities to get your name in the hat! Congrats to Laurel in her role as the W&W leading lady, and what a fabulous opening set delights showcasing exactly why she's so deserving of this honour! This trio is simply adorable! Given where I live, the wee penguin, sharing wishes from the North Pole, really captures my attention..and my heart! Festive and fabulous, all! Thank you so much for your kind words! I appreciate them so! Hi Carla! Thanks so much! These cards are so cute! Congrats, Laurel! So excited to see you featuring her works. She's awesome. Aw Vera! You are too sweet. Thanks! 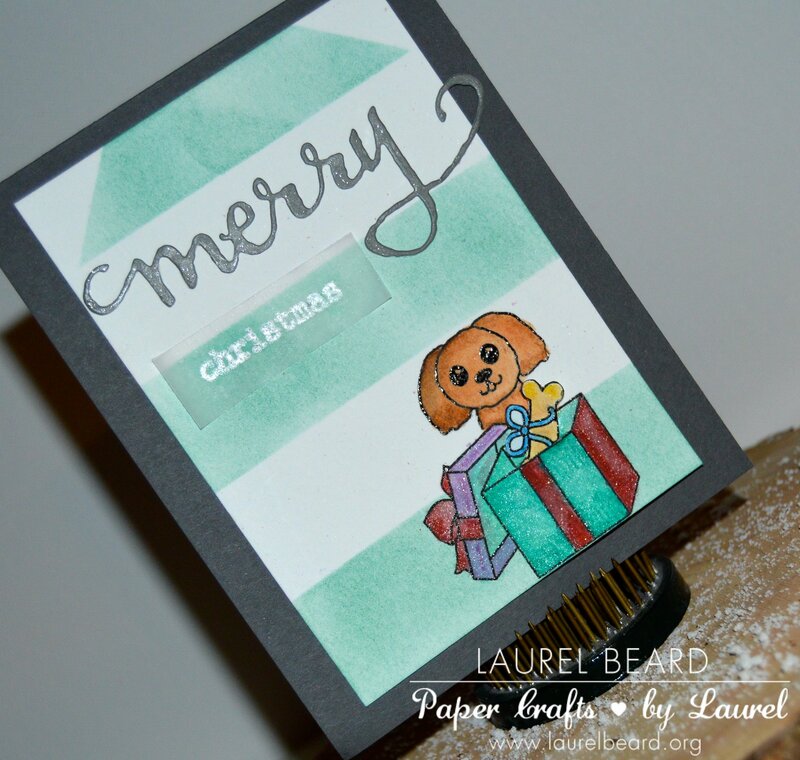 CONGRATULATIONS on being the December Leading Lady Laurel!!! 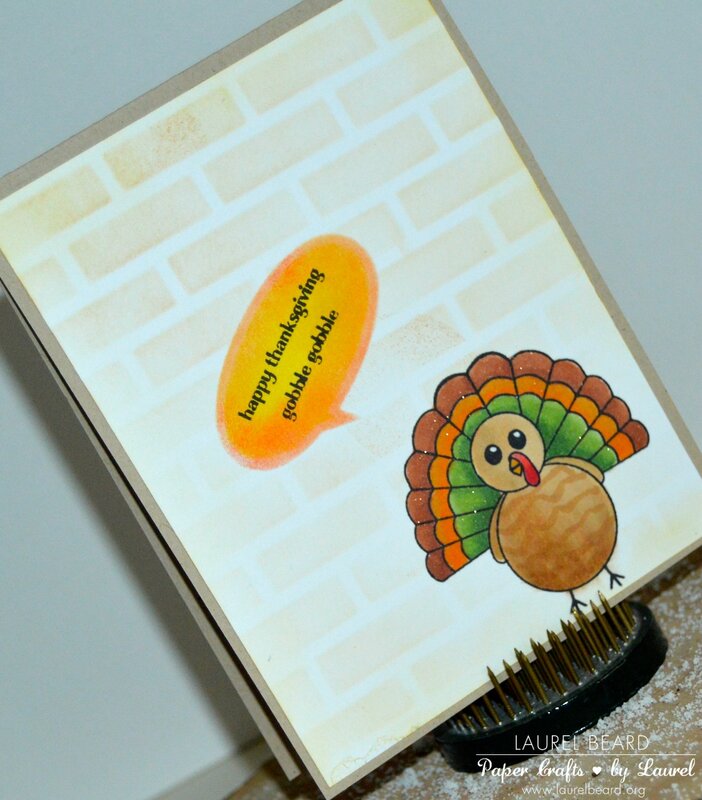 LOVE your penguin and dog, ADORE your turkey with his brick background & speech bubble!!! THANK YOU for sharing your CREATIVE INSPIRATION and looking forward to seeing more!!! Such creative uses of these wonderful products! Thanks for the inspiration!